I wanted to share with everyone about the 2 staging sucess stories I have had this week. I staged some new contruction houses for two builders in the same development the first week in April. The first house has been on the market for one year without a single offer. The master is an oddly shaped room over the garage and has been holding up the sale of this otherwise beautiful home. Three weeks after staging the builder has accepted an offer. The second house was staged one day before the local Builder`s Parade. It received a FULL PRICE OFFER the second weekend of the parade!! This is the fifth house I have staged for this builder in one year, all have sold in less than three months. The first one sold in one week! A year ago this builder did not believe in staging, did not want to pay to stage his house but I convinced him it was worth the money. Now he is my biggest cheerleader and is telling other builders with houses sitting on the market to call me. I LOVE MY JOB. Here is an exciting testimonial that when properties are Staged and Priced properly they DO sell. This house has been on the market for well over a year maybe even two, it was vacant...28 days ago I staged it and here is the email I received today from the owner. Staged Homes DO Sell!! I guess we have good news, we have offers very close to our latest asking. Dropping the price seemed to be the only way to get people to move on this though once inside the staging kept them engaged and excited about their own possibilities. Home inspection this morning and then hold our breath till we get the results and then waiting for closing on April 16 . . . This home was on the market for 5 months. After working with the clients and encouraging them to move into their new home. They left me with some of the essentials of staging and within 9 days it was under contract. Another Staging Success!!! This vacant house sold 3 days after I staged it. The new buyers even wanted to purchase all of my furniture with the house! The house had been on the market 210 days prior to staging. A great success story for all involved! My clients are very good friends of mine & they have 3 very rambunctious boys under 8 yrs old, and were planning on living in the home until the day it closed and keys were handed over to the buyers! Basically, I had a challenge! Not only to stage a home that had a lot of STUFF, but also to be able to keep the stuff out & the house & light colored carpet clean & keep the house staged, especially during showings, when I was not around. The best part about this challenge, is that, I had Motivated Sellers, ready & willing to do what it took to get the house sold! The day before the house went on the market, they were leaving for a week, a perfect opportunity for me to have the carpets cleaned & the house staged! So, I was prepared. I gave them a list & a week prior to them leaving & the house going on the market, I went on-line to ASPBOXES.COM & ordered a wide variety of boxes for them & had them shipped to their front door, so that they could begin the daunting task of De-cluttering, packing, & dumping what they didn`t need & give me a clean slate (house) to work from the next week. Guess what? It worked, they did it! They de-cluttered & I staged, and it worked! From photos to open house presentations, the house showed so well, it sold on the second day from someone who came through the open house with their agent! The house also appraised at selling value, even though other homes in the same neighborhood had been on the market for 60 days or more w/no sales in the past 3 mos. It sold in 9 days & closed in 30, God is Good! This homeowner had a staging consultation. He listened very carefully, asked lots of questions , then went to work on the un-decorating, de cluttering, and a little furniture re arranging. He laughed when I told him opening up the Living Room curtains would earn him at least $500. He finished his list of "homework" and then had the open house June 16th. His ERA-Richmond Realtors, Linda Peters & Leslie Berger, knew I had been there and had been talking about and promoting the house to a number of people--but not showing it. Eleven couples showed up for the open house. One offer came in that night and two more in the next two days. It sold in 3 days. The owner worked hard, but it paid off. Staging consultation on June 4th. Moved out and closed by July 6th. "Staging--It`s Positively ConSTAGEious!" This is a group of 20 new homes. A model had been previously been staged by someone in the Realtor`s office. Not one of the homes sold in 9 months. The Realtor called me to stage from a referral in his office and they sold 5 homes in the first week! All the homes were sold by June 1st but one. I staged this home on a Friday. Realtor had an Open House on Sunday and they got an offer that day! Got another job from the homeowner that day as he is an investor. The homeowner was very aware of how the market had slowed down. She knew that she had to do everything in her power to stand out against the competition and to price the home right She called me to preview the property and an appointment was setup. She had a few pieces of furniture, but had basically moved out most of her personal belongings. After looking at what I had to work with I was confident that I could make this home look great! With a few accessories, table settings, plants, art work, toss pillows, bedding and lamps I was able to turn the interior into something that any potential buyer would be proud to call home. I asked the homeowner if I could leave my fliers and cards out to promote my business and she was receptive. After the staging she called and left me such a great message. She said this house has never looked so good and would like me to "stage to live" her new home. For me the best part of the job is getting the wonderful comments and appreciation from the clients. It makes it all worth wile! This home had been listed for 192 days prior to Staging by a Realtor who had priced it $25,000 too high for the neighborhood. The home owner is building a new home with a builder who has partnered with us to offer Staging as an incentive to buyers. The homeowner followed all of our recommendations, listed the home with a new Realtor at the appropriate price, and the home sold 9 days later! What a relief to the homeowner and proof once again that Staging works! First showing, first buyer, put a contract on the property. The Realtor said, "Bobbi, Thanks for all your help in staging my client`s Streeterville studio downtown. I was sure everyone who walked in was going to want to buy it but as it turns out, we didn`t get to find out! The first person through the door made an offer and my client was thrilled with you and you made me look great too, thanks, Bobbi!" Staging works! This home was on the market for 49 days. The Realtor was about to lose the listing to the homeowner`s friend. He was smart and found me listed with the Maumelle Chamber of Commerce. I worked with him .The homeowner was happy he had uses an ASP and allowed him to keep the listing. I staged it on a Saturday and they had a open house Sunday. They had two offers, the 1st week it was staged and the second offer they accepted after being staged for 14 day. The agent and I were both very happy,but the homeowner even more. This home was on the market for 90 days with no offers, at the insistences of the homeowner I was contacted to stage the property. It sold two days after staging, what does that tell you about the importance of staging!! Please note that this house sold in a market that is extremely slow!! There are 75 other homes in the same subdivision for sale and a few in foreclosure. The home ower accepted a low offer because the homes in this subdivision are not moving. She called me and said "It sold because of the staging you did" - "I dont know that it would have sold without staging it"
The realtor realized the home was beautiful, but lacked color and punch. With 9 houses in the over $300,000 price range within a few blocks of this home, she recognized something must be done to get this house sold fast. A home priced over $300,000 is in the upper level of homes in our area. We went in, rearranged the owners pieces, placing some in different rooms. We also brought in accessories, drapery and a few pieces of furniture. There were two offers within two days, and a finished sale 17 days after staging. I had marketed with this realtor for over a year, she is now a true believer! In the present real estate market, the only way a home is sold is looking great and right pricing. I have gone to other realtors asking them if they have listings on the market for a long time, consider a staging consultation instead of another price reduction. Sometimes, as little as $2500 can make a huge difference in whether a home sells or not. This is exactly what happened in Garwood, NJ. The smaller 3 BR home was renovated and vacant. When I was called to consult for a possible staging job,the first thing I realized was that you walked right into the living room. And all you saw was the fireplace in the middle of the room. Prospective buyers were not going to be able to figure out where to place furniture and this could be a BIG turnoff in getting this home sold. I was given the job by the seller. At first he did not want me to make any holes in the new walls, so I was limited to furiture and accessories only. But the home did need some pictures etc. I staged the kitchen, LR ad DR with rented furniture and my accessories, and both bathrooms. When the owners saw it they were so happy but commented that the walls looked bare. They then agreed to allow me to stage the walls. After I was finished, the home had an offer in seven days. Hi all, Another very simple fix of staging that sold a home! I took this property listing after it had been on the market almost a year. Taking the listing was contingent upon my sellers` agreeing to stage the home. I knew exactly why this home had not sold. It was an entirely blue exterior. I had my clients paint the house and shutters in buyer friendly colors. We added some beautiful potted flowers to the front step and a wicker chair. I minimally staged the interior since it was vacant. It was under contract within 3 weeks for full asking price, which was more than it had been previously listed for, and closed. Staging does work!! And works extremely well. This was my first time giving a price to Stage a front yard so I underbid myself quite a bit. It turned out quite beautifully, just the way I envisioned it would. It gave the house the curb appeal it needed to attract potential buyers and attract buyers it did. It actually attracted several potential buyers within days of the Staging and they signed a contract on the house 24 days later. This was a beautiful Victorian home that had been lived in for 20 years by the owners. It had a great deal to be gotten rid of, painting to be done, and carpets to be removed to reveal the hardwood floors. Then I could go in a stage the property. The seller had kept the things I told her in the preliminary appointment and we could then arrange and stage what furniture was left. I brought in a number of things from my personal inventory to round out the look. The first couple through the home purchased it for full price in this market! This owner was desperate to sell after the listing expired. He contacted me as a last resort. I guaranteed that his unit would look its best after I staged it, but couldn`t guarantee the sale of it. To my surprise, he contacted me 3 weeks later to tell me that my "staging did the trick" and that he wanted me to de-stage it in a few weeks. We were able to get this property staged, sold, and de-staged in about a month! The homeowner needed to move the house that had been on the market for 30 days. ( slow market right now) I provided a consultation for this homeowner and was very impressed with how much they jumped on board and got done! I came in and helped with furniture placement and a few little details. That was on a Thursday by the weekend they had 2 offers and one was accepted! Who says the Real Estate market is slow? Not when you have the house Staged. This was the first listing for the agent to have staged and the homeowner. Needless to say they are both believers in Staging. The listing agent said that when she had the Realtors tour that she only got great reviews, NO Negatives or Suggestions! The home owners were the best to work with, everything I suggested for them to do exterior and interior, it was done. It was a great experience for all of us. This home was staged before photos were taken for the MLS. When the photos hit the MLS they had calls for showings every single day that it was on the market. It sold in 30 days, the average for our metro area is 71 days on market. It also sold for more than the average price of similar sold homes in the neighborhood, and 10,000 more than the realtor expected it to fetch. This house was a mess after the occupants moved out. With very busy lives and 5 kids and 2 dogs, the sellers did not really maintain the house that well. After a full week of staging and contractor work, the house was gorgeous! I wanted it to be in the market longer so I can talk more about how staging helped this home but after one day we got a full price offer! Our market for un-Staged Homes is SLOW...however proving again staging sells faster. It had two offers in 28 days...the highest bidder WON! This property is listed on my "staged Properties" I am going to make an EFFORT to log all my SOLD staged properties here!!!! Homeowners knew the value of Staging, wanted a quick sale and did agreed to do all of the Staging presented in the consultation. Home was under contract in 14 days from date of listing. After reading Barb`s books I staged my Pasadena home and received $110,000 over the asking price. The house sold the first day on the broker`s open but since we advertised for two open houses the following weekend we kept the house staged and received 6 offers by Monday. I was hooked on staging! I knew when I moved to Oregon that I would look into staging as my new profession and the only way I would do it was through Barb`s courses and earning my ASP designation. Thanks Barb! I love this one! This house had been on the market for 5 months vacant. The homeowners called me from Las Vegas where they had moved. I staged it and it got an offer the day after staging! Homeowner`s comment: "There is no way anyone could convince me that the money I spent on your fee (and the painting and cleaning) isn`t coming back to me double in the price I got in this terrible market ....and so quickly - 8 days after listing! Wow!" Homeowner`s comment: "My Realtor said that our home was fine and did not need Staging. But we know it can`t be fine." "We had no difficulty embracing your ideas, even though some of them were not our taste or our choice, but we immediately understood the benefit of your suggestions. As you know our collaboration was a great success. We sold our house after only three days on the market and we were offered full asking price. Without a doubt, this success was a result of your input (our hard work) and we credit you and the home-staging with the wonderful outcome." This house was immaculate and needed little. However it had been viewed by over 45 possible buyers, with not one bid. I re-arranged furniture, and brought in 3 items. The next day two buyers viewed the home and both put in bids. The contract was signed in less than a week. It was a win-win for all. The Realtor hired me because she listened to the potential buyer complaints. She knows her business, her customers and she loves "the Magic" (as she says) I can perform. With a minimal investment these cooperative and motivated sellers were able to reap the benefits of ASP Home Staging by getting a full price offer in 14 days! Staging DOES work even in an confusing market! The property was very formally decorated as the sellers entertained a great deal. It was difficult to appreciate the space for all of the silver, china, rugs furniture and collections from their world travels. Once those items were packed away and the seller had an estate sale, the rooms opened up and the buyers were amazed how spacious the rooms were. The seller had been very reluctant about my 5 pages of suggestions, but completed every item, even painting the front door red. The only regret from the seller was that they didn`t STAGE the property sooner. STAGING SELLS! The homeowner appreciated that his realtor suggested they have their home professionally staged. It was beautiful and only 2 years young. The existing decor was very eccentric and would not appeal to all buyers. We transformed the house in just two days of staging. The realtor had his first open house 3 days after staging. Within 24hours he had two offers for FULL asking price and the home was sold for 60K over list price!!! WOW! Nothing had sold for over 1 million ever in that development! Please note staging costs of $14,000 included landscaping, paint, new lighting, staging, and rental furniture/accessories for 3 months. The homeowners lived in another state and this home was a rental. After renters moved out, I was able to help provide contacts for painting and a handy man. The home was staged & contracted in 10 days! Agents who previously saw the home before staging were amazed & gave kudos for the updates and staging since it`s what they say SOLD the home! I LOVE helping people move on with life & this was a joy since owners were out of town! The agent was trying to skimp on accessories but we told her she couldn`t skimp on plants because they were part of the staged look. She paid for the staging instead of the client and this was her 1st experience with staging. She was totally blown away! Then, getting two offers with one as a back-up and getting a higher price than listed was icing on the cake. This staging took on a special meaning since it was my own mom moving. Our market has been slow and it normal takes about 3-4 months to sell these condos. I staged it, it went into our MLS system, had an appointment to show that day and a full price offer within a 24 hour time frame. Something did the trick!! What else could explain it but the staging. Mom was happy and I was happy and sad at the same time. Happy to see staging work and sad to see mom leave. I totally believe staging works, but continue to have an office of "doubting Thomas`". Guess I will have to stage and sell more. Works for me! Julie Jones ASP Realtor Columbia, Tn. This was a vacant Brand New construction condo, 2 bedroom, 2 Bathrooms overlooking a beautiful lake view. This property sat and sat on the market with very little traffic for 219 days. Since it was new construction, the owner was competing with the developer to sell the property. I am an ASP Realtor and from day one I was trying to convey to the owner how important it is to stage the property. She was very reluctant but finally after 219 of my persistence in trying to get her to realize she needed staging, she FINALLY staged the home. We still had very little traffic after the staging; however, the 1st person that walked in after the home was staged put an offer on the home only $4500 less than the asking price. The owner then told me she wished she would have staged the property long ago because it sat vacant for 7 months and she was paying a mortgage on the property all of that time! The developer was having problems also selling their remaining units, in the condo development which also were vacant. After hearing her staging success story, the developer contacted us and asked us if we could stage the developers units so he too could have a staging success story! WOW!! Our buyer ended up "gutting" the place even though it was Brand new, tore out carpet and put hard wood floors, put granite countertops in kitchen and bathrooms etc... I highly doubt that property would have sold for even close to what the owner got if the property was not staged!! Somehow even though the new owner renovated they still saw the value. WHY???? Because staged homes SELL!!!! A home that I Staged was very cluttered. So the homeowner rented a Pod. They did everything that was on the room by room house report that I prepared for them. Left only 3 to 5 pieces of furniture in each room and cleared out ALL THE CLUTTER and put it in the Pod and had the Pod removed from the driveway before open house. The rest is history sold in 21 days in the middle of December (the slowest time to sell a house in New Jersey). Thanks for teaching us well Barb. I am grateful to you for having a wonderful business. This is a success story for the client-18 days on the market just 4 days after staging, it was under contract. This was my first staging opportunity. I wanted to use what I had learned in the ASP Staging Class to help my mother sell her home. The house had been on the market, previously, for 1 year and then re-listed after a few months and remained on the market for over 3 months. After I completed the staging, we received an offer from the second couple that viewed it. The young woman said, "I don`t want to look at anything else. I want this house!" This was 3 days after staging! This beautifully renovated but vacant home sat on the market for 2 1/2 months with 100+ viewings and no offers. We staged it for a Sunday open house and it was under contract the very next week! I met with this client for a consultation on Thursday evening. Her home had been on the market for 6 months prior to this. She became so excited that we staged the property that night. When we left the home Thursday evening (4 hours later) all the client had to do was sweep the floors. There were 2 appointments to show the property on Friday. On Saturday morning client received a full-price offer for her home, which she accepted. Client was thrilled! "I just wanted to thank you for taking the time to collaborate with Sherwin Williams. It has really added an extra value to my staging service along with saving my clients money! 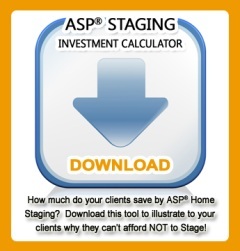 My Staged 4 Living client just saved $384.67. Also, agents are more apt to call me when they FIRST get the listing before their clients start preparing their home for sale as they should! I can`t wait to find out what you will be offering us next! I had to write you with an update to MY Christmas Blessing Story.....I am so moved by this whole "staging experience". Although I am exhausted beyond reason, I wanted to share my staging story with you. I admit I was a little nervous at the task at hand. After all, how does a novice stager like me (who just completed the ASP course in October) get asked to stage a home for the RedCRoss/Volunteerrs of America project in southern Alabama? The only explanation needed is God Power!!! All I can say is Wow! This morning I ventured out in my U-Haul truck headed with a "sleigh" of blessings. I hadn`t met the lady who will live in the house, I hadn`t even seen the house. All I knew is I needed to furnish a 2bedroom, 1-bath house for a lady who lost everything and has remained homeless since Hurricane Katrina. Bette, it was the most amazing thing when I went outside and starting gathering my "greenery". I needed some accent greenery for the yellow tulips I bought without reason this morning!!! I didn`t know why I picked yellow at the time.....As I made my way back into the back of the house, I was reminded by the aftermath of Hurricane Katrina when I walked a weather-beaten shed in the back yard. I look further and noticed a yellow painted cast iron water can lying in the rubble. IT was just what I needed for the "Barb arrangement". As I walked in the house, I realized that this was not just an ordinary can, but a reminder of hope, a reminder of rebirth. I am will send a picture of the sweet arrangement tomorrow. I just wanted to say thank you, thank you, thank you.....You inspired me more than you will ever know. I am so proud to be a part of this profession. We do make a difference! The seed was planted. This IS my calling. I hope you donâ€™t mind this email but I stumbled across your company website and itâ€™s just beautifully done. I am a stay-at-home Mom looking to start my own staging business. I live in the mid-cities and have been decorating for friends and family for yearsâ€¦for freeâ€¦ and now that my youngest is in high school I want to make a little money doing what I love. I have done a lot of research on the subject and my BIG question is "Do I need to become accredited"? Itâ€™s not like I will be performing brain surgery on anyone. I see that you and your partners are certified stagers. What are the benefits to getting certified and what is the best course to take? Thank you for taking the time to read this rambling email. Any suggestions you can give me is greatly appreciated. How exciting to finally be able to make money doing what you love! It is certainly a big step to start your own business, and you are starting off right by contacting people already in the business for professional advice. As the owner of the largest and most successful Staging company in north Texas, I feel it is extremely important for Stagers to be Accredited. Granted you will not be performing brain surgery on anyone, however you will be helping them during a very stressful and important time during their life. You need to be equipped to handle questions and objections carefully, while still stressing the importance of changing the way they live in their homes. As the way you live in your home and the way we market and sell properties are two very different things. Staging is not decorating or design. In design you are making the furniture and accessories reflect the homeowners personality and style, whereas in Staging you are depersonalizing the property to turn it back into a house and make it appeal to the broadest market segment as possible. I have watched as many people take on Staging without the proper tools and they have hurt their clients more than helped them. Many times my company will get called in after a decorator has attempted to Stage a property and it still sat on the market for months longer than it should have. Just remember it is not about getting jobs for yourself, itâ€™s about helping the client sell their largest asset for top dollar, and in the quickest time possible. So the long and short of it, is YES PLEASE GET YOUR ASP DESIGNATION. 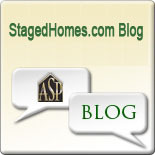 Please visit the Stagedhomes website at www.StagedHomes.com to find out more about the Staging industry, as well as information on how to obtain your certification. I believe that there will be a class here in the Dallas area in September. Another reason it is so important to obtain your certification is so that you can participate in the Dallas Chapter of the International association of Home Staging Professionals (IAHSP). This organization is a valuable resource to Stagers, as it gives you a support system and people to depend on when you need help. 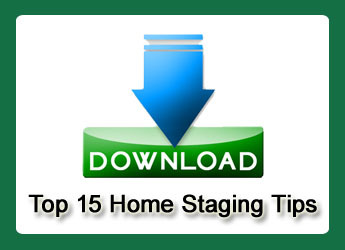 As you begin Staging more houses and larger houses you will find that you need help to implement your Staging design. As a member of DIRC and IAHSP you will find many other Stagers ready to help you. The organization also is important because of our community service projects, and its ability to promote professionalism and ethics throughout our community. I also feel that in the next five to ten years you will see the State and local government regulating the Staging Industry, just as you see them regulating the Design and Real Estate Industry now. If you have any other questions please feel free to email or call me. Good Luck and Best Wishes on your new business endeavor! Equity Enhancers Home Staging & Design, Inc.
We had a great success story last week and would love to share it with you. We staged a 1.1 million dollar home in Marlboro, NJ. The home was occupied, but also needed some furniture and accessories. We finished staging on Thursday afternoon and the first open house was held that Sunday. Within 24hrs they got TWO OFFERS for FULL asking price. In the end the house sold for $60,000 over asking price!!!!!!!!! Isn`t that incredible!!! The homeowner, Realtor, and the several other Realtors that the home seller interviewed all expected the house to sell for under 1 million. What a HUGE return on staging investment!" "Here`s one that made my head spin! I live in a modest, well-cared for manufactured home community here in Eugene. Properties in this community often languish on the market because they are typically owned by elder residents whose homes are filled with furniture and treasures collected over several decades, meds, oxygen tanks, etc. 3 months, the elder neighbor was still living in it and it received no offers; he then moved out of state and the next 2 months, the home was vacant and didn`t sell. which included painting the entire interior of the property, having it cleaned, and professionally Staging it. Within a week of her discussion with him, the home was painted, I Staged it, and it sold on the FIRST day of the FIRST Open House in 2.5 hours (did I also mention that the homeowner received several thousand dollars more than the original list price for his home?). The buyers put down earnest money that first day because they said the house was so lovely that they knew someone else would fall in love with it too, and would want to buy it, if they didn`t secure it for themselves. This testimonial blows all of my other statistics out of the water! I LOVE THIS BUSINESS!!!" I wanted to share with you revelation that I had last week. I recently finished doing a Consultation for some absolutely wonderful clients that did almost everything that I had asked them to do. There was so much work to be done, but I was very pleased with the results and their cooperation. One of the items on the list of things was for them to put away at least 3/4 of the several hundred DVD`s that their 4 year old daughter owned, it was tough, but they did it. I also loaned them the DVD "How to Stage Your Home to Sell for Top Dollar". When it was time to return it to me, they said that their daughter was going to miss it because she didn`t have much else to watch now. Your DVD became an instant hit with 4 year old Kelsey and you now have a fan in the "under age 5" set and she continues to spread the word to her preschool friends about Staging. I thought this was such a cute story to share.